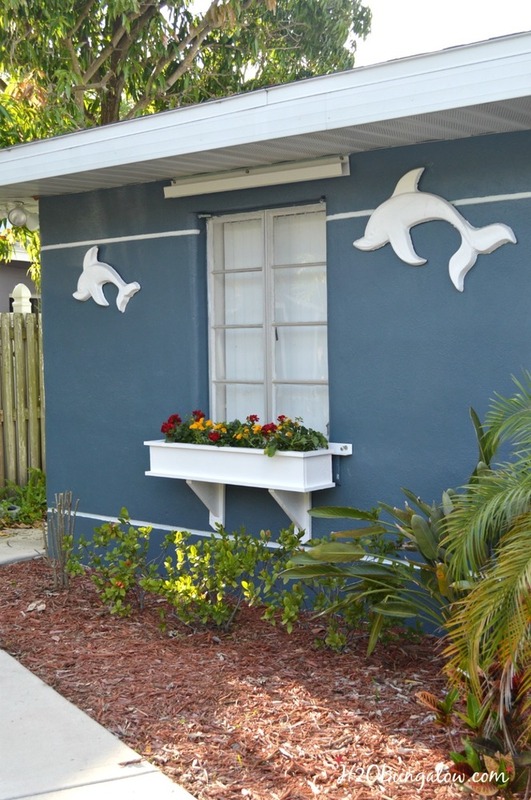 What could be more welcoming than a house with colorful flowers in a front yard window box? 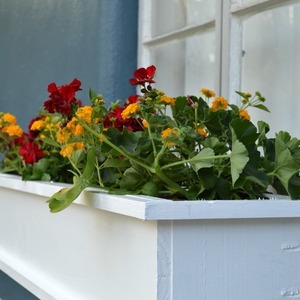 This easy and thrifty DIY window box project is the perfect choice for a quick way to add color and warmth to the front of your home. Note: My window is 36” wide with a 45” concrete ledge below it which is why my window box is 45” long. 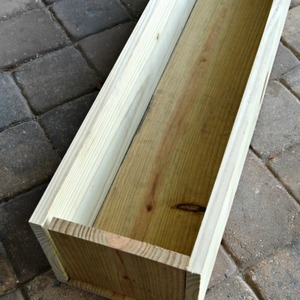 Be sure to measure your own window and adjust your board lengths as needed so you love your new window box as much as I love mine! Put each board in place as they are cut to size. If there is a measurement off a little, or one of the ends needs a little trim, you’ll see it right away. 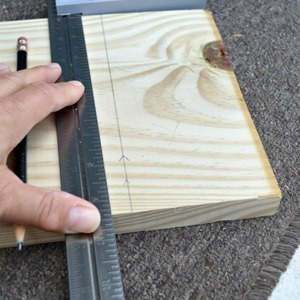 Make pocket holes with a Kreg Jig in the two side pieces. See photo for placement. A. Side interior - 3 pocket holes to attach the front panel, 2 sets of pocket holes to attach the bottom panel. B. Side exterior – 3 pocket holes to attach the back panel. 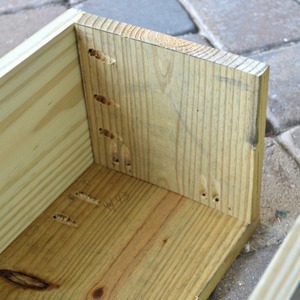 Make pocket holes with a Kreg Jig on the bottom inside panel. See photo for placement. A. Bottom inside panel - 4 sets of 2 pocket holes to attach the front panel. Using 1 ¼” pocket screws, attach the bottom panel to the front panel. Attach the side pieces to the bottom and front panel. 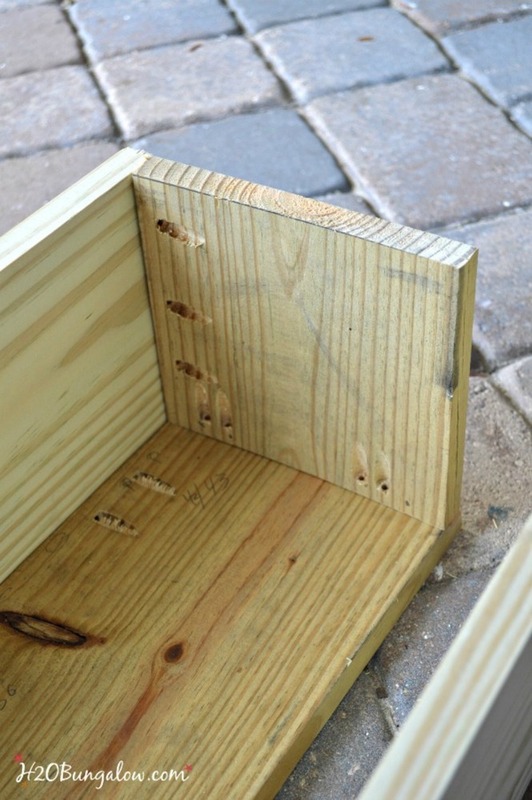 Make pocket holes with a Kreg Jig on the exterior bottom panel. See photo for placement. A. 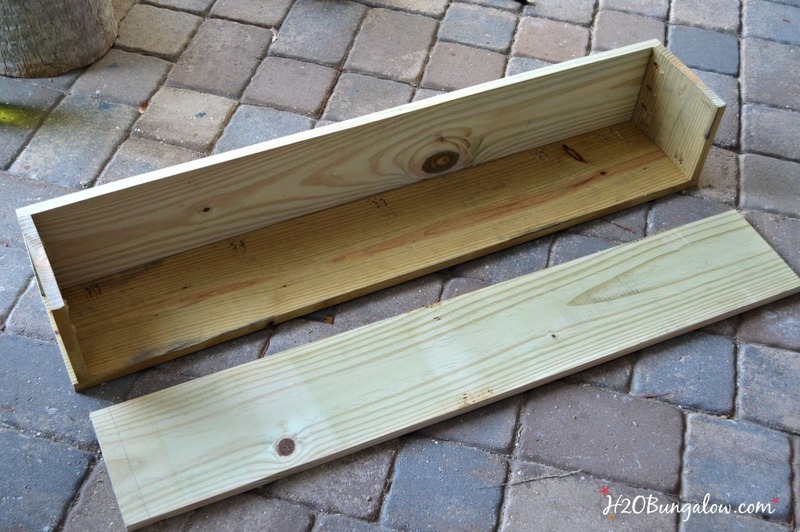 Exterior bottom panel – 4 sets of 2 pocket holes to attach the back panel. 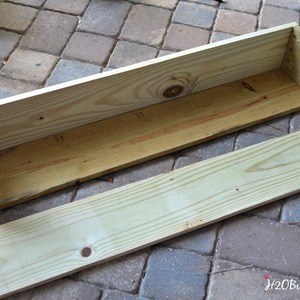 Using 1 ¼” pocket screws, attach the back panel, attach the two side pieces to the back panel. Optional trim. 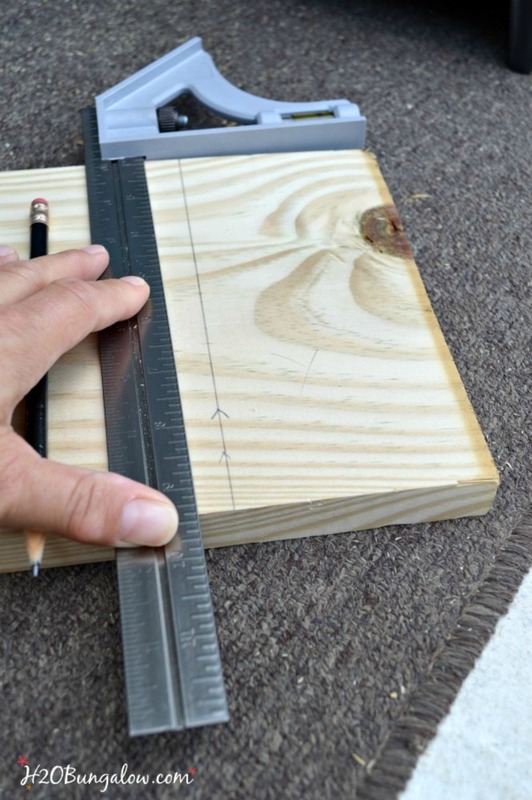 Use the Miter saw to cut upper and lower 1” x 1” trim. Attach trim by placing a bead of wood glue along the planter edge and securing each piece with the Airstrike gun. You may want to drill a few drain holes in the bottom of the window box at this time. Fill pocket holes with wood plugs or wood filler. 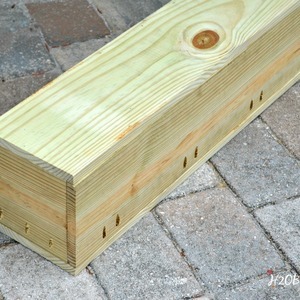 Fill any other nail gun holes or gaps. Sand any rough spots if needed and paint with exterior grade paint. 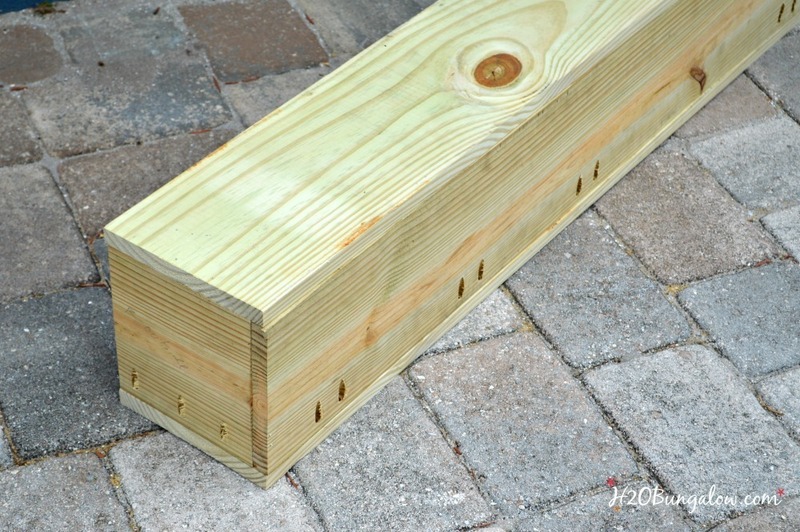 Install support brackets with appropriate mounting hardware for your home exterior. 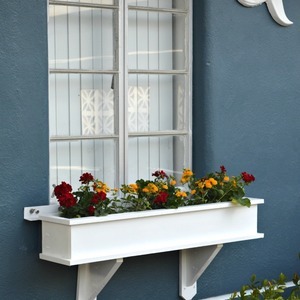 Place your window box on the brackets and secure if desired. Plant some colorful flowers and enjoy your beautiful new window box! 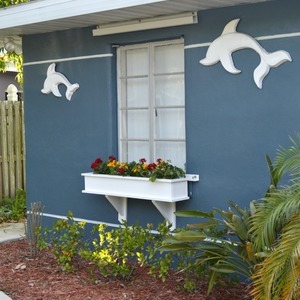 What could be more welcoming than a house with colorful flowers in a front yard window box? 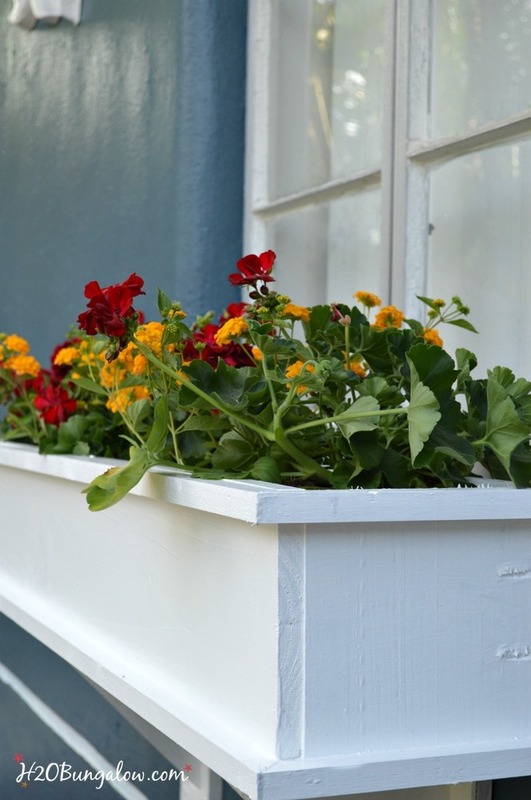 This easy and thrifty DIY window box project is the perfect choice for a quick way to add color and warmth to the front of your home. Note: My window is 36” wide with a 45” concrete ledge below it which is why my window box is 45” long. 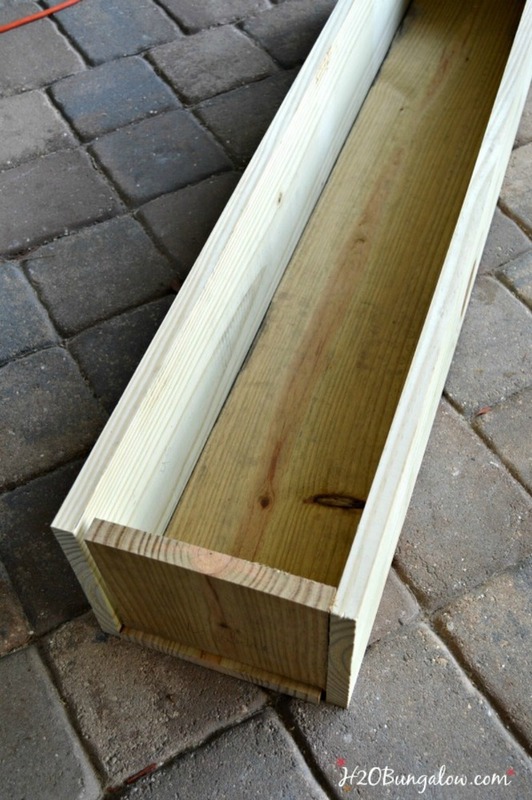 Be sure to measure your own window and adjust your board lengths as needed so you love your new window box as much as I love mine!